Ingredients: water, flour, rising powder, salted oil. How to make a good quality pizza at home. Try to remember the secret of a good pizza , is in the well-risen pizza base, well cooked and cared; toppings must be few and of high quality. These rules, by themselves, will promote the maximum in your pizza as you take it out of the oven with kindness and skill. On these pages we will propose age-old recipes, as memorandum, collected and selected from ancient books and qualified writers to modern up to date recipes. Thank you to have chosen us. Rising Powder can be used fresh (check that the colour is as light as possible and must be bristle (friabile) otherwise it is better not to use it) or dried (pre-packaged in sealed bags, granules are easy to preserve, but it must be dissolvable in water at 38 C). Salt must be used (only hygroscopic), so you must choose sea salt. This propriety helps to achieve a longer rising time. Flour from the shop is usually a weak flour so cooking times are shorter (2-3 hours) and the water absorption is around 50% (every kg of flour absorbs 50 dl of water). The ingredients for toppings are at the choice of who is making the pizza, just one piece of advice: do not mince mozzarella, it will modify the taste and will not melt properly. Quantities can be increased or decreased according to need, as rising powder must be decreased if the environmental temperature is above 23-25 C (i.e. in the summer) A pizza base made according this recipe will produce 3.07kg of ready pizza base, sufficient to prepare four standard home pizza trays. To make the dough, take two big containers and place in each one half of the flour. Divide water in two glasses and dissolve salt in one and rising powder in the other; pour the salt solution in one of the flour containers and the other rising solution with the other. Mix separately until both reach a consistent composition, then combine the two and stop to knead just until the dough feels smooth, velvety and just a bit damp. If you have a dough machine, always start with the flour, then add the water until the rising powder has been dissolved, keep about 2 dl on the side to dissolve salt that must be added when the dough has reached some kind of consistency. Always avoid salt and rising powder contact initially because the first will inhibit the rising process. The dough will be ready when the container in the machine looks clean. 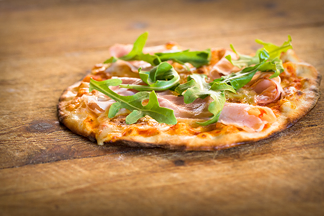 Now start to divide the dough to form small portions of different sizes according to the thickness of the pizza you want to obtain when cooked. Dough can be stored for aging in the fridge at 2-6 C. Aging of the dough according to temperature can vary from 6-8 to 24 hours. The dough should rest (at the centre of the tray where it will be cooked) for about 3 hours at constant temperature (23C), this will allow the rising powder to produce gases that will help the dough to rise. if “white” pizza and left to rest for at least an hour before proceeding. If the dough has been keep in the fridge for ageing, for a correct rising, handle the dough as if it was just kneaded, and the let it rise for the same time. Is the last thing to do but is also the most important because it will give you the possibility to really make the best quality product, if well performed. In a home oven, the temperature required will be on the average of 250C for a variable time between 12-15 minutes. Therefore, the oven needs to be switched to maximum and the cooking can’t start before the temperature is reached. Cook just the dough with tomato or oil for about 8-10 minutes. Take the tray out of the oven, put the toppings according your recipe, then replace the tray in the oven to complete the cooking of the dough and topping for the remaining time. If you want to taste the smell and the fragrance at its best, the pizza must be eaten as soon as it is taken out of the oven.